Writing Essentials Online combines a proven approach to developmental writing instruction with sentence-to-essay-level support in a single easy-to-use digital product. Author and educator Miriam Moore (Professor of English and ESL at Lord Fairfax CC) draws on her extensive training and expertise in teaching academic writing to students with a range of experience. 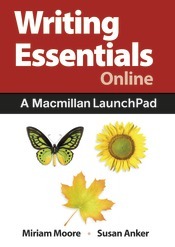 Available through Macmillan Learning’s LaunchPad platform, the modules include all of the essentials of sentence, paragraph, and essay writing--with grammar instruction and a rich selection of readings. The modular structure of Writing Essentials Online allows instructors to choose the topics that best meet the unique learning needs of their students, no matter their writing or confidence level. These texts can be packaged with Writing Essentials Online at a significant discount.